Shown on this page are several early Japanese obi--most from the famous Nishijin weaving district in Kyoto. It was here that elaborate silk brocades were produced on complex draw looms from the 15th century on. In the last part of the 19th century, in the Meiji period, jacquard loom attachments were introduced, and even more complex fabrics became fashionable. Obi with lavish use of gold and silver threads became important kimono accessories; these long sumptuous sashes were often given more attention than the kimono themselves. They were frequently more expensive. The most highly regarded were woven in complex brocade weaves, as represented by those on this page. Maru obi were the most formal, and were popular in the early 1900s. They were patterned throughout on both sides, and because of both their stiffness and exorbitant cost, they gradually were replaced with other styles. Sometimes these obi can be opened for display, if desired, making a piece double the width, though normally traces of a fold line remain. Fukuro obi were slightly less formal, and first appeared in the late 1920s. Because only one side was brocaded or decorated with other complex jacquard patterning, they were less bulky to wear than maru obi. The elaborate decoration sometimes covered the full front length, but more often covered only about 60 percent of the piece, appearing again at the far end for a few inches. 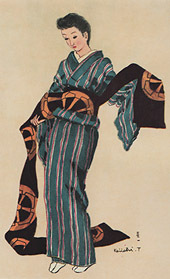 The plain section was not seen when the obi was worn. Westerners have found multiple ways to display these luxurious textiles. They are easy to hang over a rod for a wall decoration. In our photos, approximately half of the total length of each is shown. They also make fabulous table runners. To see large detail photos of the obi below, click on the inventory numbers. To see a variety of Japanese kimono, click here. Our HOME page will direct you to textiles from other parts of the world. 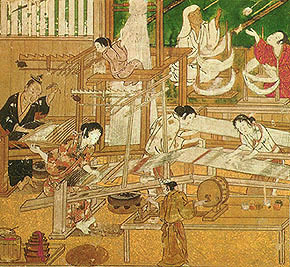 The man in black kimono is weaving on a draw loom, while his young assistant perched above pulls strings to open the various complex pattern sheds. This is the kind of loom used until the Meiji period for lavish brocades and other complex weaves. In the late 19th century jacquard attachments replaced the small assistants, although the weave structures remained the same. 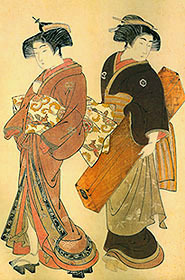 Kano Yoshinobu, 16th century.